Indiana State University's Environmental Science Club broke free of the classroom for a mixture of fun and hands-on learning. The group spent a weekend camping across the Midwest this fall, visiting Cave-in-Rock State Park in Southern Illinois, the Ben E. Clement Mineral Museum in Marion, Ky., and the Garden on the Gods in Shawnee National Forest. The semesterly planned trips were finally able to begin this year thanks to agreeable weather, said club president Natalie Erlenbaugh. "Each trip is supposed to be environmentally-focused, dealing with nature, so it gives our students -- most of them who are environmental science majors - an opportunity for hands-on experience while also having fun," she said. Erlenbaugh is a junior environmental and human systems major from Indianapolis with a minor in sustainability. The camping group consisted of 10 students and faculty adviser Jeffery Stone. The name of Cave-in Rock State Park may sound strange initially, but Erlenbaugh said the park is a "large limestone cave that was carved out by high-tide by the Ohio. Bandits used to stow away their treasure along there, so I thought it would be really cool to stop and look at it along the way. We have a lot of geologists in the club." After setting up camp, Erlenbaugh and her group traveled to the Ben E. Clement Mineral Museum in Marion, Ky., which offers tours and rock digs. The campers arrived in the afternoon and participated in an hour-long tour of the museum, which is home to more than 500 minerals and fluorescent rocks. Each room had a theme, said Erlenbaugh -- a room full of quartz, a room for glow-in-the-dark rocks and ones that she found had interested patterns when lit from below that revealed the rock's structure. The students were taken to the dig site and given hand-held U.V. lights, which made rocks shine in purples, greens, oranges and blues from the minerals within. Erlenbaugh said the group was able to collect a five-gallon bucket of these rocks, half of which will be featured in an ultraviolet display in the science building. Stone said the night "mining" for fluorescent minerals was the most fun. "Everyone was engaged and excited to be there. The students would yell out every time someone found some new rock glowing an unusual color under the UV light, or when they came across a nest of spiders -- there were a lot of spiders there," Stone said. He said the students did not mind the cold, damp or darkness. "They just cared about what we found and how we could find more." Stone not only found importance in the fun aspects of the trip, but also he noted the students seemed more willing to ask questions than in the classroom, possibly because of the casual environment or increased curiosity. "If you want to encourage students to become engaged and enthusiastic about nature, you have to go into the world and experience it firsthand," Stone said. "More than just the experience, I think learning something on a trip like this sticks with students -- they won't forget what they learned two weeks after they take a test over it." Andrew Rettig, a senior construction management major from Indianapolis, joined the club his freshman year because of his passion for the environment and his desire to explore it. "My favorite part of the trip was the night dig after we looked at the museum," Rettig said. "On the trip, I saw a lot of the topics covered in my ENVI 170 class. The hands-on experience of seeing the topics was a great, memorable experience." On the campers' way back to Terre Haute, they stopped to enjoy the pleasant weather with a hike along the 320 million-year-old sandstone cliffs of the Garden of the Gods in Shawnee National Forest. "My favorite place was probably the Garden of the Gods," said Erlenbaugh. "The views were spectacular and it was just a time in the fall when all the trees are starting to change colors. It was just beautiful." The Environmental Science Club is already excited for this semester's trip, whatever that may be. Rettig said he formed friendships through the club and that the trip allowed the group to grow closer as friends. The environmental science majors on the trip taught Rettig about the minerals studied on the trip. "Our next planned field trip is to the Indiana Museum," said Stone. "But for the next big outdoor field trip, we've talked about going to explore some of the caves in southern Indiana, I think." The club is made up of majors in geology, environmental science and related majors, but also includes students who enjoy the environment through hiking or other activities or want to help in the community. "We're a fun group, with lots of fun people," said Erlenbaugh. The group meets at 5:30 p.m. Thursdays in room 164 of the science building. 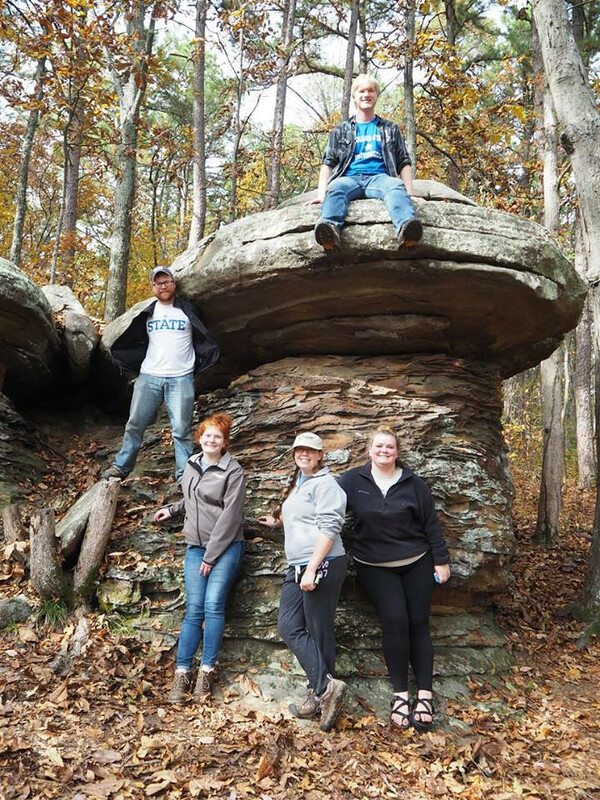 Photos: http://photos.indstate.edu/Other/Media-Services/Submitted-Photos/Staff-Uploads/i-MWnfCMm/0/X2/pic1-X2.jpg -- Indiana State University students pose at the Garden of the Gods in Shawnee National Forest during a recent trip. http://photos.indstate.edu/Other/Media-Services/Submitted-Photos/Staff-Uploads/i-K37L73g/0/O/pic2.jpg -- Minerals are seen at the Ben E. Clement Mineral Museum in Marion, Ky. The group spent a weekend camping across the Midwest this fall, visiting Cave-in-Rock State Park in Southern Illinois, the Ben E. Clement Mineral Museum in Marion, Ky., and the Garden on the Gods in Shawnee National Forest.